What started as a regular hit on the Minnesota Kite Society (MKS) website this past March 10th, has turned into one of the most symbolic and spiritual journeys of my life. Lois Norrgard with the Minneapolis office of the Alaska Wilderness League asked MKS to participate in a joint venture to fly kites symbolic of the bird’s migration from Alaska down through Minnesota and back. It is also in celebration of the 50th Anniversary of the Arctic National Wildlife Refuge 06 Dec. 1960. 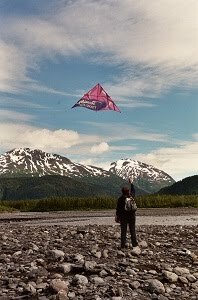 The Alaska Wilderness League website has a page designated to “Build and fly an Artic Kite.” It also gives you plans to make a bird shaped glider kite. It uses the kite as the logo, “The Artic is Alive” with a person flying a red kite. This contact eventually grew to include work with the Alaska flier’s (www.alaskiters.com). The plan would evolve into several different kite events starting with Wishes For the Sky in April 2010 at Harriet Island in St Paul, Minn., flying in Denali National Park, a scheduled fly in Anchorage, Alaska, both in July 2010, and a MKS fly coming in Dec 11, 2010, weekend closest to actually anniversary Dec 6, and end the next spring back at Wishes for the Sky about the time of the actual migration of the birds back to Alaska. In 1999 the writer, Demi, (Demi Hitz), wrote the children's book Kites, Magic Wishes That Fly Up To the Sky. It is a story of a little Chinese girl that sent messages on kites so she could, "...fly it right up to the sky and the gods in heavens will see it immediately." One of the shapes she chose was the fat Swallow that symbolizes greatness, innocence and peace. And so a migration of birds begins. In April 2010 as president of the Minnesota Kite Society, I received five swallow kites at Wishes for the Sky, an Eastern philosophy Earth Day event organized by Marcus Young. It is described as a “free experimental, public art event celebrating the arrival of spring, environmental sustainability and personal and collective wish-making.” The Chinese-themed event uses handmade Swallow kites, made by a master kite builder in China , that are recycled each year. 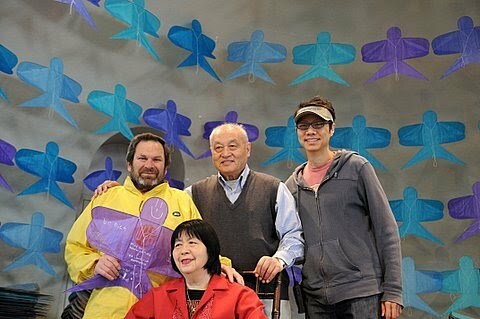 Participants receive a kite from an elder then write a wish on it and fly it to the heavens. We all become participants like the character in Demi’s book. 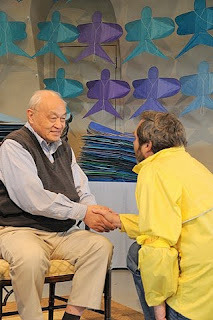 Just as I did, receiving the five swallow kites, representing the 88 species of migrating birds that begin their lives on the costal plain of the Arctic Refuge, each person receives a kite from the elder takes it to a table to write a wish on the kite, then takes it to a table to be stamped with the Wishes for the Sky symbol. The trip started with a good omen at the airport. 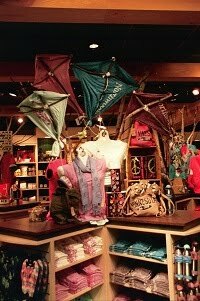 Right at Minneapolis St.Paul International past the security point was a clothing shop with shirts made into kites flying in the display window. This is good! 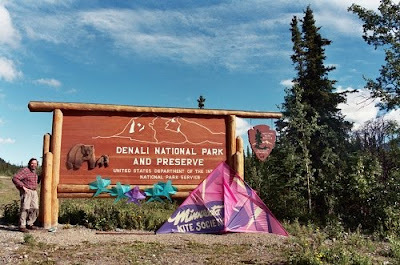 The five swallow kites and the MKS “club kite” made, by JoAnn Webber, were all taken to Alaska with the intention of flying them in Denali National Park , hopefully, in the Artic National Wildlife Refuge, and the bonus was flying at Hatcher Pass and on the moraine at the base of Exit Glacier in Fjords National Park . Now, have you ever tried to take five handmade paper kites and an eight foot delta backpacking with you? I mailed the kites to my stepson, who lives in Alaska and put the MKS kite in my son’s ski bag. But getting them through the parks was not easy. The first stop was at Hatcher Pass a 3,886-foot mountain pass in the southwest part of the Tealkeetna Mountain Range. It was the first time to let the birds fly along with the delta. It is a historic area from the first gold mining in 1906 named Independence Gold Mine and now called the Willow Creek Mining District. It is possible to see mining operations still today. However it is identified more as a year-around recreational area more popular in the winter for skiing. What struck me about the point was how up and down the winds were from the point you can see me flying. 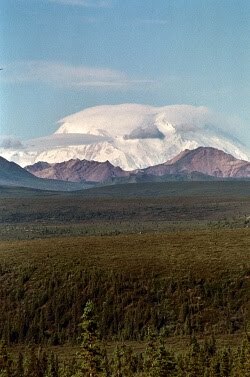 The next stop was Denali National Park and Mt McKinley. A highly discussed topic in Alaska is the statistic that, only 30 percent of the people who come to see Mt McKinley get to actually see it, because of fog or clouds weather generated by the mountain. Unbelievably, we saw it for four straight days. The swallow kites were carried each day, and to everyone the story of the kites’ representation of the birds’ migration was told. 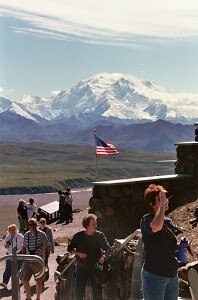 It is possible for a person to collect seven Passport Stamps while attending Denali . The kites were able to get at least six of them. They were flown in Talkeetna, a “Northern Exposure” type town that is used for major climb starting point, at the main complex where the Murie Science and Learning Center, Denali Visitor Center, Wilderness Access Center are all located, and at each stop on the 12-hour ride out and back to Kantishna. This is another small town at the end of the road the furthest point a vehicle can go into the park. As we spoke to people about our mission and kite as a symbolic representation of the birds, we learned more about other migrations. For instance we learned of a program on Rat Island on the Aleutian Island chain, where the rat population that had been started because of a ship wreck over 230 years ago.The rats left the ship and made the island their home. As the colonies grew, the rats were eating the migratory bird eggs and killing the bird population. In 2007 the U.S. Fish and Wildlife Service introduced a program to end the population. It appears to have been successful and the birds have been saved. The other migration seems to be people from Minnesota to Alaska . You can not believe the number of people we met that had roots in Minnesota . 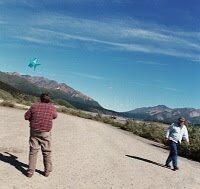 After we left the main Denali entrance area complex we flew the kites along the road at rest and viewing stops at Toklat River (mile 53), Eielson Center (mile 66), Wonder Lake (mile 85) and Kantishna (mile 91). We were so busy looking, seeing, taking pictures that kite flying was mostly symbolic. I allowed others to also participate and fly the kites. What I regret is not having the people around actually write on the Swallow kites as well. I also fear the pictures that accompany this story are pale to the awesome beauty of the scene and nothing can reflect the adrenalin that ran through my body. Maybe some males can identify with this-- this was my first major trip, I am 63, during which someone else drove, and I was in the passenger seat. I did not have to sort of keep my eye of the road, and for two entire weeks I could just look at the scenery and enjoy the colors, views, shapes, distances…it was heaven. Off we went to the Seward area, which is south of Anchorage , on the Kenai Peninsula . 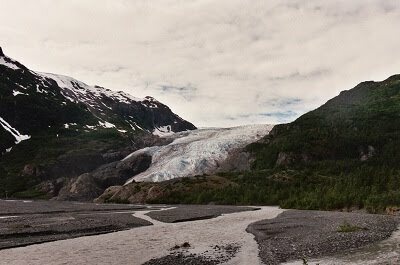 It is primarily known for sea fishing and the Kenai Fjords National Park , home of some of the only easily accessible glaciers. Again, while on a 6-hour cruise into Resurrection Bay on the Gulf of Alaska , we were able to see other migrations, mammals, a pod of four Gray whales. What is the difference between the migration of Gray whales, Tundra Swans and Swallow Kites? Gray whales migrate 6000 miles from Alaska to Baja California by sea, Tundra Swans migrate 5000 miles from Alaska through Minnesota by air and Swallow kites are mailed 3100 miles by U.S. Post Office and carried by backpack. As a person walks the trail to Exit Glacier in Fjords National Park signs are posted giving the dates of where the glacier was many years ago. I am struck by how far it has reseeded. Will it some day be gone? It is incredible to look at this ice and believe it is moving each day and know how long it has taken to recede to its current point. The winds coming down off the glacier were ideal to fly kites. I was flying the MKS kite most of the time and members of the Alasfliers were flying their individual kites. I had some small feather made up by Barbara Meyer, current AKA President and wrote on them the date the Alaska National Wildlife Refuge came into being by law 12-06-60 and did the inscription Minnesota to Alaska . The Alaska Wilderness League had a special stamp made which was also put on the feather, and then each participant received one. A group picture was taken around the MKS kite with the five Swallow kites. Betsy and Tak were given their commemorative Swallow kites. Three of the Swallow kites will return to Minnesota. The event was fortunate to get some press coverage by Alaska Public Radio and ABC Channel 3. 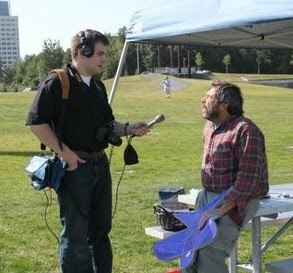 Simply by going to the MKS website and checking the past events page, it is possible to view and hear the Alaska Public Radio story. The next fly for this event will be Sat. 11 Dec. 10, at the Minnesota Valley National Wildlife Refuge. It will be one more step on the migration of the birds. It will be co-hosted by MKS and the Alaska Wilderness League. It will be winter then and the Tundra Swans will have migrated south through Minnesota but the Snowy Owl and the Sharp–shinned Hawks will be around. Different than in Alaska the opportunity to make kites will be available and fly them out in the area. Two more of the commemorative Swallow kites will be distributed to Lois Norrgard, Alaska Wilderness League, Minneapolis Office and I as president of MKS. The fifth and final kite will go back to Wishes for the Sky 2011 in St Paul to complete the environmental sustainability migration.